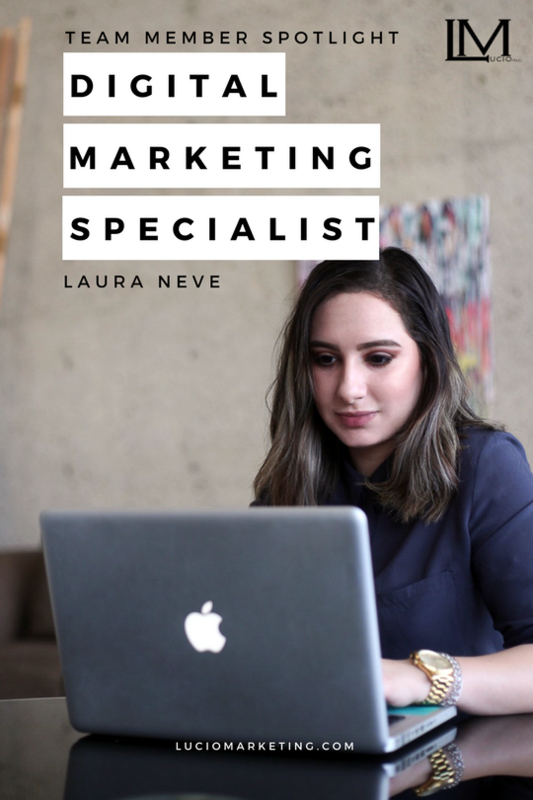 Team Member Spotlight Series: Laura Neve | Lucio Marketing, Inc. Welcome to our Team Member Spotlight Series, in which we sit down with one team member a week in a rapid fire Q&A to find out a little bit about the people who make up Lucio Marketing. Meet Laura Neve, one of our newest team members here at Lucio Marketing. We are very excited to have Laura on board our ever-growing team. Laura will be our go to lady for all things in Digital Marketing. If you see our instagram, twitter, and facebook posts; they will most likely be from her. Laura is an up-in-coming marketing specialist, graphic designer, and our featured Lucio Marketing Team Member this week in our Team Member Spotlight Series. Laura’s expertise much like all our other team members is greatly appreciated. Each segment we will feature one of our team members, find out what he/she does in Lucio Marketing, and how he/she works in Lucio Marketing while being part of our expanding team. As well as some fun facts! Q: How long have you been with Lucio Marketing? A: Just started not too long ago but I’m really exited on the campaigns we have started. A: The end result. In other works building something out of nothing and seeing how it develops and the final end result. The feeling of “Wow. I did that!” It’s a great feeling. Q: What is your favorite part about working at Lucio Marketing? A: The motivation everyone has to do his or her best. Might sound a bit cheesy but surrounding yourself with people who talk about visions and ideas really helps for personal growth. Q: What makes you passionate about this business? A: The team is like a support group and everyone is so positive and ready to go. I want to do good by the people who support me and what I can bring to the company. A: Trying new vegetarian recipes, going to concerts/ festivals, graphic design, and interior design. Q: What's your favorite social media platform? Q: What is your creative outlet? A: Art and music really inspire me. Q: Where is your go to place to relax? A: Its lame but my couch, catching up on my favorite shows with my lazy cat by my side. Q: Where is your go to place to have fun? A: I love to lose myself in a good movie or go out with a few friends for a beer or two. Q: How has Lucio Marketing helped you grow? A: Everyone’s positive vibes helps me want to do my best to help the brand succeed by creating the best content and developing my skills. Q: What is the environment like at Lucio Marketing? A: Super lively and positive! Everyone wants to motivate each other. I’ve never experienced something like it before. Q: What fun things have you done at Lucio Marketing? A: Help redesign the company's website, I’m a nerd like that I guess. Q: Describe one of your most memorable moments at Lucio Marketing. A: My first day, I've never worked for a company who is so motivated to help everyone grow in the business. Q: What's your favorite part about our road trips? A: I’ve never been yet because I am still really new but there are always opportunities to go to a lot of amazing places. Q: What kind of music do you like to listen to while you are in the training sessions? A: I like all types of music… minus country. Q: What's the best advice you've received that has helped you in this business? A: “Own It” You owe it to yourself to feel confident, if you feel confident then people will see you as confident and will listen to what you have to say. Q: How has Lucio Marketing helped you with your personal success? A: By help me sharpen my skills so I can grow in the marketing industry and in my career. Q: What advice would you give someone wanting to join our business? A: Be positive and don’t be afraid to put yourself out there. Q: What's one tip you think everyone should know about this business? A: Everything is fast paced so be ready to learn and don’t be the type to hold yourself back because Lucio Marketing is all about growth. Q: Any additional information you would like to share? A: Don't be scared that you won't fit in, because in this business we are in this together. If you are interested in contacting us or you think you are a great fit to be part of Lucio Marketing team feel free to apply or contact us on our Contact tab on our home page. This was our featured Team Member Spotlight Series this week. Thanks For Reading! If you want to find out more about Laura’s work or about Lucio Marketing and what we do, follow us on our social media channels. Lucio Marketing, Inc. is growing! Copyright © 2017 Lucio Marketing, Inc.